It has been a minute since the last edition of Northern News, but that’s only because of how busy things have been in Marquette. First there was the tournament/training camp in Denmark stretching from late-February to early-March; then came the first “Big Brother” camp; next was the Bill Farrell Memorial and the second “Big Brother” camp; and finally, the Junior and Senior Nationals in Las Vegas. Suffice it to say, NMU/OTS head coach Rob Hermann and his crew have had their hands full recently with traveling, competing, and of course, that stream of pesky final exams to wrap up the winter semester. Now that there is a fleeting calm before a trio of World Team Trials take center-stage next month, Coach Hermann is able to address a number of topics. We start off with highlighting NMU’s performance at the Junior Nationals, where Alston Nutter (63 kg) surged to the top spot. Then it is on to the Seniors and the continued ascension of Dalton Roberts (60 kg), who prevailed over a challenging bracket to eventually be named the US Open’s Outstanding Wrestler. Other Seniors are talked about, as well, including Randon Miranda (55 kg), Sammy Jones (63 kg), Travis Rice (63 kg), Logan Kass (72 kg), Colin Schubert (72 kg), and Austin Morrow (67 kg). To close out, the discussion veers back to the current happenings in Marquette, as US National Team head coach Matt Lindland along with a host of other coaches and athletes are about to converge for a training camp. 5PM: What were you most glad to see out of your Juniors at the Nationals? Coach Rob Hermann: Well, we’re young. They’re first-year Juniors, so it was about being in the tournament and getting the experience, and knowing that it wasn’t the World Team Trials. It was just getting qualified. It would have been nice to win it, like Alston Nutter. Two matches from making the World Team, that’s the ideal situation. But getting into the World Team Trials and having a second life, and just something to train for over the next three weeks, is going to make them better. And they are going to get better. Even though I wasn’t up there for the Juniors, Andy Bisek was, I think there are some matches that are going to get turned around, and I think in three weeks we will turn them around. Like I said, I wish I would have had more guys in the finals, so that part was disappointing. But we qualified everyone but three wrestlers to go further. 5PM: What does that process look like, turning around losses from Vegas into wins in Indiana? Do you individualize things for athletes or is there a blanket approach if you notice a pattern? RH: It’s both. We have open practices where guys can work on their mistakes and we have things we work on as a group. Like yesterday, we worked a lot on zone tactics. There is a trend usually as to where people are losing. We worked on trapped-arm gutwrench defense, we worked on zone tactics, and we worked on getting to the body without finishing, which were items Andy recognized as positions that our Juniors were not in, so we spent some time working on them. But that’s the benefit of training Greco full-time. We’re not back grabbing legs in freestyle and we’re not around a bunch of folkstylers. We’re in a room with all Greco guys, so we are all thinking about getting better in Greco. So it’s a combination of both. We do individualize. When we have open practices the coaches walk around and we try to correct mistakes that way. But we do things as a group, too. 5PM: Do you like this two-stage system of a National qualifier and then a Trial? RH: I have pros and cons. I like the one-stage better and part of it is because of money and traveling. But the two stages give you more competition and makes you train a little bit longer throughout the year. So I have pros and cons. My thing is that we’ve won more medals at the Cadet and Junior age groups over the last three years. If it’s not broken, why fix it? I think more people would have made an attempt to get to Vegas. There were some people missing knowing they can wrestle later on. Another part of it is the timing of the National tournament itself. Our guys were burnt just from school. The day we got back we had finals. I think with not having final exams in the back of our brains and leaving right from school that our guys will be a little fresher mentally going into the World Team Trials in Indianapolis. 5PM: Do you like what is essentially the bypassing of the University age group in favor of the U23 model? Coach Rob Hermann: I do because it fits well for our program, so I’m kind of selfish. It is also looked at as more of a World Championships where I don’t think University was. I don’t think University was ever pushed, you know? You had to be in college and it was almost like it was separated when it really wasn’t. I like the U23’s. 5PM: Getting to the Seniors, Dalton Roberts, your National champ, took another big step up. 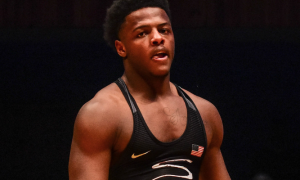 He got his second win over Taylor LaMont in the past 15 months and then probably almost gave you a heart attack during his finals match. You’ve been with Dalton since the beginning of his full-time career, so where do you rank his National title on the list of the most rewarding performances you ever witnessed? RH: When a guy like Dalton wins, we all win. The program wins, the coaches win, Dalton wins. And it’s because we know all of the hard work he puts into it, the dedication he puts into this program. We couldn’t be happier for him because it was well-deserved and it never comes from a lack of effort for him. There were a few times he got put to his back. He could have given up. But he didn’t, and he wound up getting his hand raised at the end. Dalton is a wrestler who leaves it all on the mat, but he does the same thing in the room everyday. So we couldn’t be happier for him. The job isn’t done yet. He is still two matches away from making his first real Senior World Team — even though he made the U23 World Team — but his first Senior World Team. And he’s training to not only make the Team, but win a medal. 5PM: Randon Miranda wrestled a great tournament. There were some points that maybe should have went his way against Sam Hazewinkel but didn’t, depending on how you interpret scoring. But to see Randon wrestle so well against a guy like Hazewinkel, who is and has been terrific and looked great at 35 years of age, must have caught your eye. And he is still in it. Miranda will still be a target come June in Tulsa. What did you like about Randon’s performance, and without giving out the game plan, what did you see as some of the improvements he may have to make? RH: For Randon, that was the first time he ever wrestled Sam. I have coached them both, and when you wrestle a guy for the first time you don’t know what to expect. And vice-versa — Randon did something to Sam that he wasn’t used to, either. He put him right on his back. To me, I still don’t understand the 2-2 call. We were talking about it this morning. I just don’t get it (laughs). I think they are both closely-matched and they could end up being reversed at the World Team Trials in Tulsa. It’s a matter of who shows up and who doesn’t make mistakes. They’re both competitors, and obviously, Max Nowry is in the finals. Whoever comes out of that tournament is going to have to wrestle Max two out of three. But it could be anybody. I’m not going to come out here and say it’s only going to be Miranda or Hazewinkel. It could be anybody who comes out of that tournament, but I think those are the two guys who come to mind and might be wrestling Max in the finals. Plus, they’re just fun to watch. They are two explosive wrestlers and that is good for entertainment, good for the fans. But it’s a heartbreaker when you see your own guy lose a match like that. 5PM: Two guys from the same weight class and I’ll start with Sammy, who made his first Senior National final. He had a very dominant tournament up to the final and was operating on a really strong level. He was wrestling with a lot of confidence. It might not have went his way in the finals, but still, he was impressive. What did you like the most out of Sammy those two days? RH: As we were running this morning, I told him I really liked his aggressiveness in using his legs and taking the fight to his opponents. He took the fight to every opponent. I really felt that he probably couldn’t have wrestled better against (Ryan) Mango. He got the first passivity, he was controlling the two-on-one, and he made one mistake. You don’t mess with the Mangos’ heads because they are very good at high-diving and they’ve got strong necks. But again, he doesn’t wrestle Ryan enough to get into those situations so he can be ready for them. If you look at it, that was only Sammy’s third tournament this year. He went to the Schultz, he went to the New York AC, and then it’s the US Open finals. Sammy is a very talented wrestler who can eight-point you at any given moment. He had a great tournament, he just didn’t close it out. He also knows it’s going to be a tough tournament in Tulsa to get back to the finals. But, I really liked his aggressiveness from the feet. I don’t think throughout the whole tournament, even in the finals, that anyone scored against Sammy on the feet. It was that dominant from the feet. A lot of it is confidence and he is confident going into Tulsa, and that is huge for him. 5PM: One of your wrestlers who tends to fly under the radar is Travis Rice, who used to compete at 66 kilos, and not only did he drop down in weight, but has done so with the new same-day weigh-ins. I know he wound up fifth, but I imagine it must have been encouraging to see Rice put forth such a big performance. RH: Travis had a great tournament, too. Fifth-place doesn’t seem like a lot to some people, but fifth-place at a Senior Open for Travis, he wrestled way beyond his seed. He pulled what I thought was the biggest upset of the entire tournament in beating Hayden Tuma. It just shows that with the morning weigh-in how important it is to cut your weight right. It affected a few of our athletes. Not wrestling (with) a lot of those morning weigh-ins and not being experienced with them, you try to change things at every tournament to where you can compete at that level. I think that was the huge difference between Travis and Hayden — Travis had more drive and push, where the weight cut really affected Hayden. But — I don’t want to take anything away from Travis because he scored some points and he beat him. 5PM: What was your overall takeaway of the NMU performance in Vegas, both Juniors and Seniors? Coach Rob Hermann: It’s the little things. When we got back and it was the first day after finals, I pointed out the weight-cutting, how basically, you have to be ready that first match. You can’t be cutting 12 pounds the morning of because it does affect you. I was happy with Austin Morrow after having shoulder surgery. He ended up in the semis and then came back to wrestle for third. That took a lot of drive. He came back from a crucial labrum injury, so I was happy to see him in the mix of things. Logan Kass took fifth. I mean, that was a surprise. Matt Lindland asked me what I thought about our performance as a program. I told him that we pretty much all lived up to our seeds and then some. It’s a tough tournament, but we showed up and our guys performed. But yet, as a program and as a coach, we’re never happy until we win every weight class. And that’s what we are striving for, to have a guy at every weight class on the Junior and Senior World Teams to represent the US and win medals. 5PM: Go back to Kass for a second. He wrestled tough in Cuba and got his heart broken in the bronze match. And then he came out in Vegas against one of your program’s scariest competitors in Colin Schubert and got him out of there, which surprised me. He really seems to be hitting a different level and had an eye-opening tournament himself. RH: He’s in the right weight class, 72 kilos. 66 was a huge weight cut for him. He’s like Anthony Linares. Linares wrestled better at 72 than he does 67. I don’t know why he (Linares) goes down, but he does for the Opens. Last year he didn’t and he took second at 72. This year, he took fifth (at 67). Some guys just wrestle better up a weight class and Logan is one of them. He has a little more in the tank when he is up a weight, and this is the right weight class for him. If it was an Olympic year, he’d probably go 77. At 67, he doesn’t have the engine to wrestle at that weight. He runs out of gas halfway through the match. 5PM: What about Schubert? Is he still in the right weight class? RH: Colin, yeah, he’s in the right weight class. He just had a bad tournament. I hate to say it. He’s not happy with it, he knows he didn’t wrestle up to his capabilities. Colin also didn’t have the greatest game plan going in against Logan. He got in too many offensive positions early in the match. So, he has got to be smarter and have a better game plan going into each match. But he’s back working, getting up at 5:30 in the morning and doing some things with Austin Morrow. He just has to get back in the saddle, and in a month, he’s got another tournament. The good thing is that he already qualified. Last year, he had a great World Team Trials. 5PM: He did, he had what I thought was the most impressive Trials performance from someone who didn’t win. RH: Yes, so he’s capable of turning it around. You can only lick your wounds for so long. After about a week, you just have to realize that you have to mark it up to experience and move on. 5PM: Lastly, the argument could be made that, at least currently, the OTS has become the epicenter for Greco-Roman in the United States with all of its activity. RH: Look at what we’ve got going on in our room just for the month of May. Matt Lindland comes in today; Dennis Hall comes in tomorrow; Momir (Petković) is arriving May 20th; Ivan (Ivanov) was supposed to be here yesterday but we rescheduled him for September; Robby Smith is coming in on the 20th; Dan Chandler is sending some of his Minnesota Storm wrestlers here on the 20th; and LeRoy Gardner is bringing eight wrestlers up here to train all the way up to U23’s. It’s the room to be in because we’ve got the bodies, we’ve got Andy Bisek, the trainers, the dorms…it just seems like it’s the hub to get some good training in before a major competition. 5PM: You’ve got Coach Lindland in town for the camp and the workshops, then there will be more prep, and this is all going to take you through to the U23’s and the Juniors. Right after that will be one of the marquee events for Northern, which is the Superior Camp. Coach Rob Hermann: Yes, we’re going to be training for the Senior Trials during our Cadet/Junior Superior International Camp. We’ve never done that before. It’s unusual, it’s going to be different. Our room is going to be really, really busy with newcomers. The good thing about it is that I heard that our Cadet World Team is also going to be here during that time. Sweden is coming with 14 athletes. We’re probably going to have our Seniors training here during a different time of the day so our Cadets and Juniors can watch how the Seniors prepare. Yeah, we’re going to be really busy. We will have over 100 wrestlers for the Superior Camp. It’s not too late to sign up yet, but we will close it after we hit a certain number. It’s exciting because we’re busy, and when you’re busy, time goes by quickly.